英文摘要：In view of the whole structure shipbreaking emergency plugging device, using UG software to establish three-dimensional model of the whole structure of sealing devices, through Ansys Workbench software tolerance of emergency plugging device structures and function structure of the important components of stress analysis, and to the whole structure is optimized based on the simulation results. Then the overall situation of devices in the cloth of water resistance in the process of calculation and simulation analysis, to determine the overall device is the best form of cloth. 陈林春, 史方敏, 陈孝强, 等. 宁波-舟山港水域船舶事故应急体系模式探讨[J]. 浙江交通职业技术学院学报, 2010(1):34-38.CHEN Lin-chun, SHI Fang-min, CHEN-Xiao-qiang, etc. 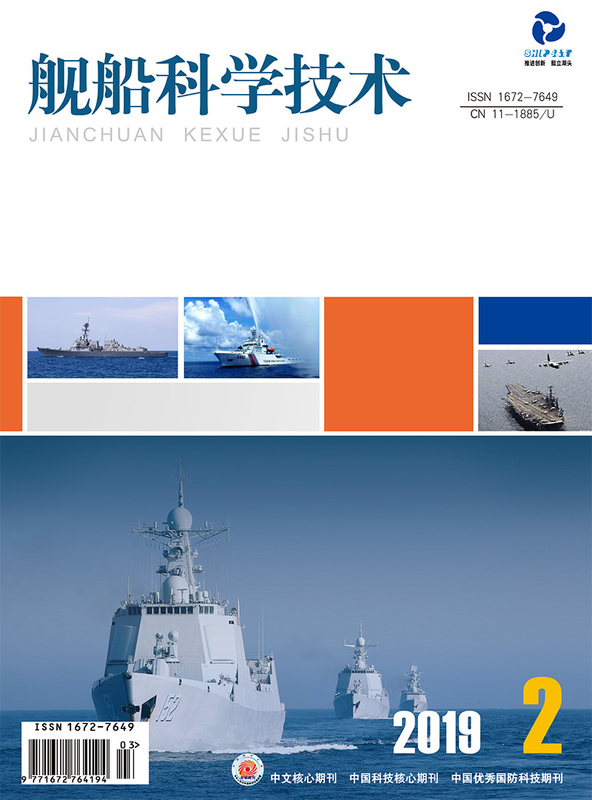 Discussion on the model of ship accident emergency response in Ningbo-Zhoushan Port[J]. Journal of Zhejiang Transportation Vocational Technical College, 2010(1):34-38. 王祖温. 深化共识求同化异推动两岸航运教育事业跨越式发展[J]. 航海教育研究, 2011(4):1-5.WANG Zu-wen. Deepen the consensus, assimilation, promote cross-strait shipping education career development by leaps and bounds[J]. Maritime education research, 2011(4):1-5. 笪靖. 浅谈船舶堵漏措施[J]. 中国水运(理论版), 2007(7):11-12.DA Jing. Introduction to plugging measures of the ship[J]. China Water Transpot, 2007(7):11-12. 郝艳萍, 慎丽华, 森豪利. 海洋资源可持续利用与海洋经济可持续发展[J]. 海洋开发与管理, 2005(3):50-54.HAO Yan-ping, SHEN Li-hua, SEN Hao-li. Sustainable utilization of marine resources and marine economy sustainable development[J]. Ocean Development and Management, 2005(3):50-54. 赵谱. 我国船舶溢油污染事故溢油量评估方法及其应用[J]. 海洋环境科学, 2009(4):469-472.ZHAO Pu. Evaluation method of oil quantity in chinese ship oil spill pollution accident and its application[J]. Marine Environmental Science, 2009(4):496-472. 王雪君, 娄朝辉, 袁成清. 船舶事故的特点与原因分析[J]. 中国修船, 2014(3):12-15.WANG Xue-jun, LOU Zhao-hui, YUAN Cheng-qing. The characteristics of ship accident and cause analysis[J]. China Ship Repairing, 2014(3):12-15. LAN G-H, XIE T-H, JIN L-A, et al. Current status and future prospect of ship's patching technology[J]. Ship Science and Technology, 2009(3):11-18. 王坚敏. 人机工程学理论在船舶事故研究中的应用[J]. 中国航海, 1993(2):42-52.WANG Jian-min. Apply ergononies theory to the study of the vessel's accident[J]. China Sailing, 1993(2):42-52. 吴智勇, 曹强. 船舶碰撞后应急措施的探讨[J]. 武汉船舶职业技术学院报, 2006(5):42-56.WU Zhi-yong, CAO Qiang. Emergency measures for collision between ships[J]. Wuhan Marine Vocational and Technical College, 2006(5):42-56. 韩云东, 金良安, 郭模灿, 等. 刚性桨叶工作位置对涡旋流堵漏效果的影响[J]. 中国造船, 2011(2):139-145.HAN Yun-dong, JIN Liang-an, GUO Mo-can, et al. Leak stopping effect of vortical flow induced by a rigid propeller at different working positions[J]. China Shipbuilding, 2011(2):139-145. 叶邦全. 安全营运-失事堵漏器材[J]. 船舶, 2009(1):61-64.YE Bang-quan. Article security operations chapter crash plugging equipment[J]. Ships, 2009(1):61-64. 兰国辉, 谢田华, 金良安, 等. 舰船堵漏技术研究现状与发展对策[J]. 舰船科学技术, 2009, 31(11):134-138.LAN Guo-hui, XIE Tian-hua, JIN An-liang, etc. Current status and future prospect of ship's patching technology[J]. Ship Science and Technology, 2009, 31(11):134-138. 李胜通. 浅谈小型船舶防碰撞、防泄漏及应急处置方法[C]. 第二届广东海事高级论坛, 中国广东广州, 2008.LI Sheng-tong. Dip a small ship collision, prevent leakage and emergency disposal method[C]//The Second Senior Guangdong Maritime BBS, China Guangdong Guangzhou, 2008. 刘超, 温纳新, 贾绪智. 堵漏板堵漏过程中的水动力学分析[J]. 航海技术, 1998(1):8-11.LIU Chao, WEN Na-xin, JIA Xu-zhi. Water dynamics analysis of patch board in the process of plugging[J]. Navigation Technology, 1998(1):8-11. LUBCHENCO J, PALUMBI S R, GAINES S D, et al. Plugging a hole in the ocean:the emerging science of marine reserves 1[J]. Ecological Applications, 2003, 13(S):3-7.